It doesn't matter if the Divine Office is celebrated in a modest environment. but she was a great Abbey. he joined the monks to say the Office. Oh... if the praying voice of the monks raises inside splendid places,where during the centuries precious treasures of art, has been accumulated. 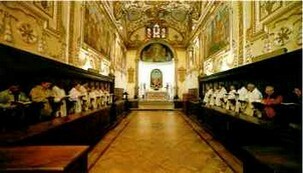 Whoever lives in the cloister must adopt the Divine Office like his own particular work, with which directly attends to God. How he could be really looking for Him "si revera Deum quaerit", without thinking in first place to Him, to His perfection, to His work: "Et laudabunt Dominum qui requirunt eum" (Psalms. XXI, 27)"The more we find Him, the more He reveals Himself to us, and more we feel attracted to celebrate the perfection and the gifts: "Quaerentes enim invenient eum, et invenìentes laudabun eum" (St. Augustine). The Saint Founder doesn't exclude other work. The history, as well the tradition that we must consider with humble respect, show us how the Benedictine Order have completed, during the centuries, many and varied tasks useful to the Christian civilization. But it is also true that the most important work for him, and to which we must attend, it is the Divine Praise, which is also, together with the Sacraments, the surer way to unite with God: the Divine Office that glorifies Him so much, becomes an abundant source of holiness for every monk. The Benedictine Blessed Alfred Ildefonso Schuster, once Cardinal Archbishop of Milan, was usual saying a very nice reflection for those people, who believe that whoever pray he is of no use. In a boat not everybody must lean from the side where they are pulling in the nets, but some ones have to stay steady on the opposite side, otherwise the boat would overturn. In the same way, in the Church, while there are those who work with people, we need those who consecrate themselves to prayer, so that the Divine Action makes effective the active Apostleship.